Come and discover one of the most important astronomy complexes in Europe. We can change how you see the universe! Get to know the astronomical observatory at Calar Alto, the facilities and science that is carried out there. The Astronomical Observatory of Calar Alto is the largest in continental Europe, with professional telescopes up to 3.5 metres aperture. It is operated jointly by the Institute of Astrophysics of Andalusia (Spain) and the Max Planck Institute for Astronomy in Heidelberg (Germany), producing a joint venture of international science. The visit consists of an instructive lecture about the observatory, the scientific use of telescopes in astronomy, followed by the visit to the building of one of the telescopes *. The tours are guided by qualified personnel with scientific training. The approximate duration is 1.5 hours. * The telescope to visit depends on the availability due to scientific and maintenance tasks. And usually the first choice will be the 3.5-metre telescope. Visits can only be made by reservation that have been confirmed before the event. For security this visit is not suitable for children under 8 years. This includes school visits. • It is essential to bring enough warm clothes because the observatory is situated at 2200 metres altitude and the domes are cooled to the outside night temperature scheduled for that night. This applies even in summer. The conditions in the mountains are unpredictable and can change dramatically in short periods of time. Visitor reception centre at the western entrance of the Observatory. See Map. *Please inform us of the exact numbers of people attending for a detailed quote. Explore with our astronomers one of the darkest skies of Europe. Calar Alto Observatory is set in a privileged place where the night sky is protected by law to provide exceptional conditions for scientific study. Taking advantage of these particular conditions we offer a special guided tour through the universe. By observing the night sky and learning about some of the investigations carried out at the observatory, we can achieve a better understanding of the universe around us. We begin with an introductory talk on the premises of the observatory, to learn about the research in astrophysics done from Calar Alto, followed by an interpreted observation of the night sky with portable telescopes around the observatory. 36€ per person with a minimum group of 10 and maximum of 15. In this activity the facilities or telescopes of the Observatory are not visited, because it coincides with its scientific operation. If you want to visit one of the professional telescopes please refer to the daytime Visit to the Observatory. The minimum age for admission to the activity is 6 years old. Visitor reception centre at the western entrance of the Observatory. See the map. If you are interested in booking this activity to be carried out privately for your family or group of friends please get in contact with us by email or telephono. This activity is subject to a minimum fee of 360 euros. 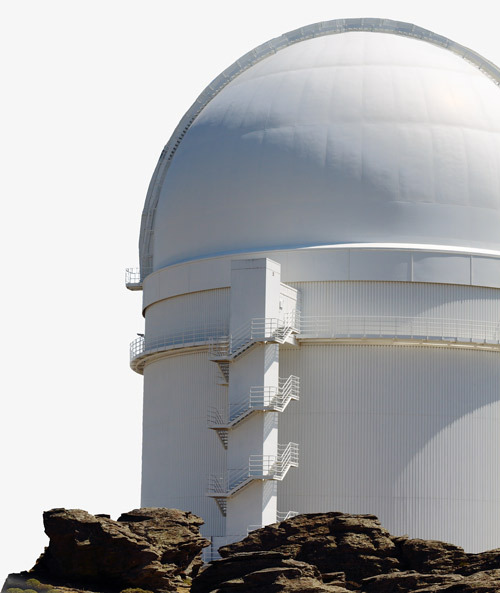 Calar Alto Observatory and Azimuth offer you the unique and exceptional opportunity in Europe to use for viewing, the professional research 1.23m telescope of the Observatory. 18:45h – We meet at the meeting point at the western end of the Observatory next to the car park and visitor centre (Meeting point map). 19:15h – Reception and welcome to the Centre by the Session Director. Welcoming light refreshment (includes alcoholic drinks) and introduction of the event program. 20:00h – Talk / presentation at the library providing an enjoyable way to introduce you to the history and evolution of the Observatory, the relevance of the scientific investigation carried out and the basis of astronomy and the study of the Universe through the use of light. 21:00h – Then we will enjoy a dinner based on local products in a relaxed atmosphere. 22:30h – After dinner it is time to prepare for the activity of astronomical observation through the 1.23m telescope of Calar Alto, the jewel in the crown of astro-tourism activities offered from the Observatory by the Azimuth team. Let our imagination run while viewing through the telescope taking us from the stunning observation of planets in the solar system, to the always delicate structure of planetary nebulae, the spherical shapes of globular clusters or contemplate the light of the most distant galaxies. 01:00h – End of experience and farewell. – The temperature inside the telescope dome is virtually the same as on the outside. It is essential, even in summer, going to the dome well prepared with warm and comfortable clothing and appropriate shoes, so that the cold does not spoil the enjoyment of this unique experience. – Because of both, conditions inside the dome and security measures, the minimum age for this activity is 12 years old. – If you do not have any previous experience looking through telescopes it would be very important to consider prior participation in any of our astronomical observation activities “Discover the Calar Alto Sky”. The view through a telescope aperture as large as the 1.23m can be seen and interpreted much better after having had experience with smaller telescopes, which also provides context and appropriate comparison. Please, use the contact form in the webpage or write to info at azimuthspain dot com.